Everything you need to reach your next big idea – and seriously impress those clients. Our meeting rooms boast a spiffing bright and modern design and come decked out with whiteboards, TVs, phone conferencing, ninja-fast WiFi, unlimited snacks and endless productive vibes. The Cube meeting room is a perfect space for board get-togethers and impressing clients. The room can fit 8 – 12 people and is suited and booted with an Apple TV, conference phone, super-fast WiFi and all the free tea and coffee to keep you going. Aptly named after one of London’s most iconic buildings with what we think is an equally nice view. The Shard meeting room can fit 6 – 8 people and benefits from all the essentials and gadgets you need to nail that important presentation. More like your living room more than your typical meeting room Borough is the perfect space to have a laid back catch up with clients or get together with the team, and can fit up to 5 people. Relax in your armchair knowing you have Apple TV, conference phone, super-fast WiFi and sugary snacks to keep you going. Hold your next meeting with Camden style in this comfortable meeting room that’s kitted out with everything you’ll need including an Apple TV hookup to easily share your screen with 6 – 8 people. Did we mention free coffee and all the pretzels you can eat? Flooded with natural sunlight, the Cyberdog meeting room can hold up to 8 and has beautiful original illustrations along the inner walls. This is a great space to meet with clients or close your next big deal. Did we mention free coffee and all the pretzels you can eat? If you don’t know what an Eames chair is, you will do now – this 6 – 8 person meeting room celebrates Charles & Ray Eames with an array of chairs and designed wallpaper to match. Lots of natural light, Apple TV, conference phone and whiteboard – help yourself to tea/coffee and our 1GB Ninja-fast WiFi powered by Verizon. Drawing inspiration from the local Clerkenwell area, famous for design and bookbinding, this beautiful meeting room features books hanging from the ceiling. Able to fit up to 8 – 12 people, with comfy, reclining chairs, conference phone, Apple TV and whiteboard this room will get the creative juices going for sure! Drawing inspiration from the annual boat race, which starts from nearby Putney bridge, this impressive meeting room comfortably holds up to 8 people. Take advantage of our super-fast wifi, unlimited snacks and hot drinks for your next big meeting! This room also comes with a conference phone, Apple TV and a whiteboard. Taking inspiration from the local area, famous for The Apollo theatre, this quirky meeting room can hold up to 15 comfortably and includes a conference phone, Apple TV, and a whiteboard. With super-fast wifi and unlimited snacks, coffee and tea this is the perfect space to impress clients or to host your next big team meeting. Take centre stage at your next meeting in our aptly named King’s Theatre meeting room. With room for up to 8 people our space comes with super-fast wifi, unlimited snacks and hot drinks to keep the team going. The room also comes with a conference phone, Apple TV and a whiteboard. 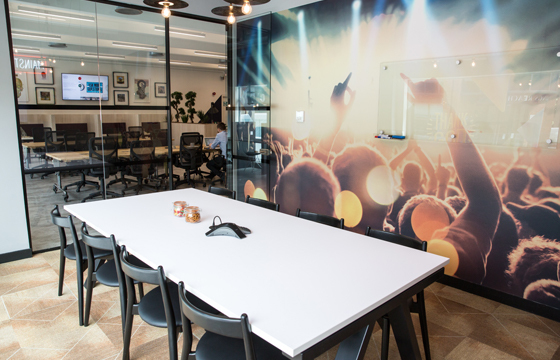 Just a stone’s throw from Broadway Market, the aptly named meeting room has a mural of the colourful Broadway strip on the wall by a local artist. Don’t get too distracted, this is a meeting room after all, fitting up to 8 people! Suited and booted with an Apple TV, conference phone, super-fast WiFi and sugary snacks to keep you going. Step into the blue calm of Lido, our eight-person meeting room in the heart of East London. Equipped with an Apple TV, conference phone and super-fast WiFi this is the place to get your creative juices flowing. Don’t worry, no water or swimming involved – just lots of coffee and jelly beans! Inspired by the Reading Festival, the Mainstage meeting room is flooded with natural sunlight and has a concert image wall feature. This room can fit 8 – 10 people comfortably and is a great space to meet with clients. 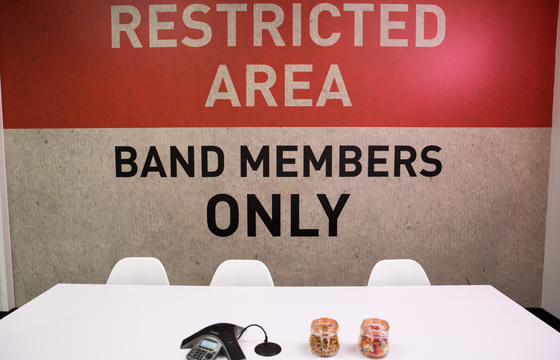 In line with the Reading Festival theme, the Backstage meeting room is tucked away inside the office space. This room has a screen and whiteboard if you need it. A great room for important meetings or just a team catch-up, fitting up to 8 people! One of four famous authors which inspired our Fitzrovia space. This room fits 8 people comfortably and has a screen and whiteboard if you need it. A great room for important meetings or just a team catch-up! One of four famous authors which inspired our Fitzrovia space. This room fits 6 people comfortably and has a screen and whiteboard if you need it. A great room for important meetings or just a team catch-up! One of four famous authors which inspired our Fitzrovia space. This room fits 10 people comfortably and has a screen and whiteboard if you need it. A great room for important meetings or just a team catch-up! Our Manchester meeting rooms are named after inspirational individuals from the local area. This room fits 8 people comfortably and has a screen and whiteboard if you need it. Our Manchester meeting rooms are named after inspirational individuals from the local area. This room fits 10 people comfortably and has a screen and whiteboard if you need it. Our Manchester meeting rooms are named after inspirational individuals from the local area. This room fits 6 people comfortably and has a screen and whiteboard if you need it. what3words gives every 3m x 3m in the world a unique 3 word address. This one describes the precise entrance of Work.Life Reading. Check it out. Fancy becoming a member instead so you can access our meeting rooms easily? Check out our memberships!